emilyreads: ADVENT FAIR this Saturday! Local peeps! 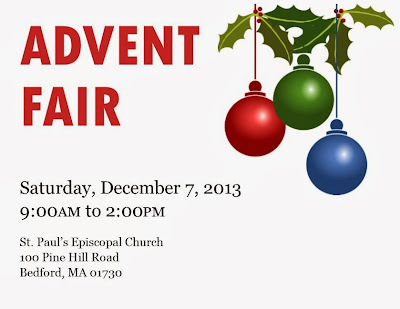 If you are looking for fantastic Christmas gifts and wonderful causes to support in a festive atmosphere for the whole family, look no further than the St. Paul's Advent Fair, tomorrow from 9:00am to 2:00pm at St. Paul's Episcopal Church, 100 Pine Hill Road, Bedford, MA. We have gift baskets, Silent Auction items (including hand-painted, one-of-a-kind chairs! ), Country Kitchen (featuring marinara sauce and soup made by my husband! ), children's activites, vintage jewelry, and a raffle for a Bose SoundLink Bluetooth mobile speaker.